We don't see Avery much any more while he's away at college, but occasionally I guilt him into sending me some photographs to stay updated on his life. 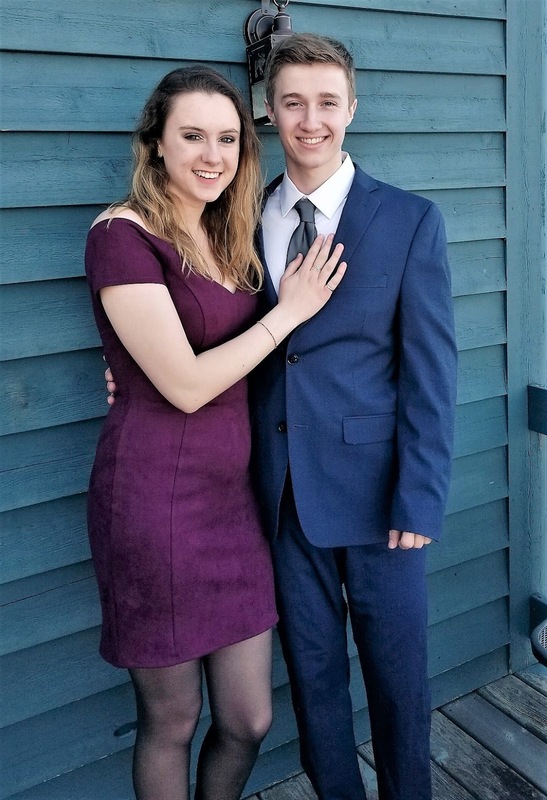 This week it was pictures of him and his girlfriend, Emma, at last weekend's formal for his fraternity. I think they look so cute together. It was a college reunion of sorts for Miss Sheri this weekend. Her friend, Kim Hohensee, was in town from Colorado and needed a place to seek shelter during the massive blizzard we had coming our way. We were glad to accommodate. Cathy also came down and the ladies had a great time reminiscing about the old days. Jeff and I weren't there during their days at Wartburg, but we did our best to stay involved in the conversation. We all had fun while the snow started building up outside. Luke decided to come home for the weekend from Minnesota State Mankato University. He told us he only has a couple of weeks of school left before he's ready to move back home for the summer. It seems so weird, because it sure doesn't feel like anything close to summer around here! We stayed inside for most of the weekend. We've had a "Historic" Blizzard that dropped the most snow Minnesota has ever seen in the month of April and it just keeps coming down. We've had something like 15 inches of snow already this weekend. This winter is never going to end! There was a break in the snow on Saturday morning, so we thought it would be fun to go to lunch and a movie. That ended up being a bad idea. The roads weren't too bad in the morning, although reading road signs became pretty much impossible. By the time we were done with lunch, the snow came back with a vengeance so we decided to skip the movie and just work our way back home again. It was pretty scary as visibility became nearly impossible. Lucky we weren't too far from home. So we spent the rest of the weekend bird watching. We keep adding more and more feeders around our house because the little birdies are just so much fun to watch. Although, they also seem to be pretty pissed about the weather. I kept thinking this guy was annoyed with us because we were sitting inside and not opening the door to let him come in and join us. Silly bird. I did feel kind of bad for them and started wondering if this group of birds just got in town after flying north for the summer. If so, they are probably pretty annoyed with themselves that they didn't stay down south for a few more weeks. Blue is getting pretty sick of not having full access to his yard with all the snow he has to navigate. But he figures it out and still seems happy, so we got that going for us. Which is nice.